When I have no sales for several days, I’m convinced that I’ll never sell another thing, ever, and that it’s time to throw in the towel. But of course I wasn’t ruined! On Sunday I sold a lovely carved wood box I’d bought for a snip at an estate liquidation sale, and then a few days later a mid-century copper and enamel brooch and a sweet granny-square afghan. And I started to feel “restored.” All was not lost! Then yesterday morning I got an email. A woman had a list of things she wanted to buy from my store, but could I overnight them to her in New York State? Oh sure. 🙂 So we worked it out and I gave her a 10% discount for good measure. 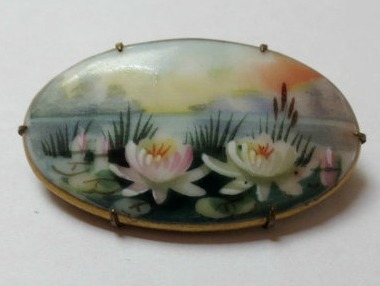 In the end she bought three porcelain painted brooches, a sterling charm, a pair of retro crocheted potholders, a Victorian silver hair comb and a heavy English charm bracelet. It’s all paid for and should be arriving…about now! And it made me wonder why I get so worried and why my “faith” in my items and my ability to pick them wavers sometimes. I like the things I sell! Even the weird, ugly things. And I have a great time finding them. Strangely, I feel like this is one of the things I’m supposed to be doing in my life right now. Oh, I know…it’s not noble. It won’t save anyone’s life. It’s not prestigious (I’m just a step above a rag-and-bone man). It’s not much of anything. But I have fun and I do make some people happy. For example, I just got another message from the buyer in New York. She told me how excited she is to get these items, particularly the two pins with lotus blossoms as she has these blossoms in her koi ponds and she has never found similar pins. I am doubly pleased that she is getting these!! So overall, I’m going to attempt to remain more positive during the slow times and just keep plugging away! 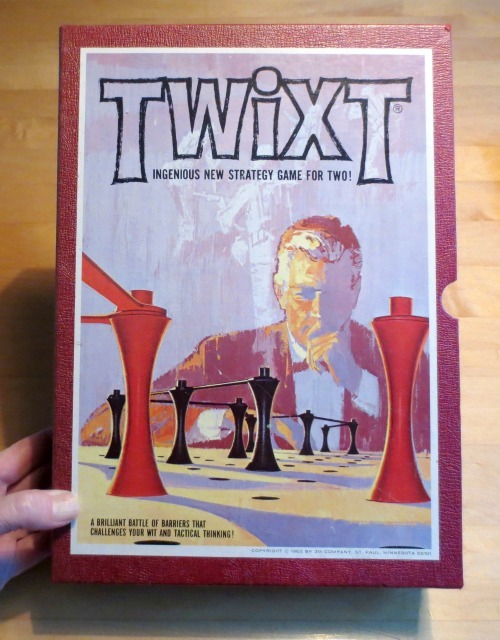 On a different topic, while my thrift store visits lately have been challenging (lots of people, high prices, too much junk), I am finding a few things, like this cool 1962 Twixt strategy game. 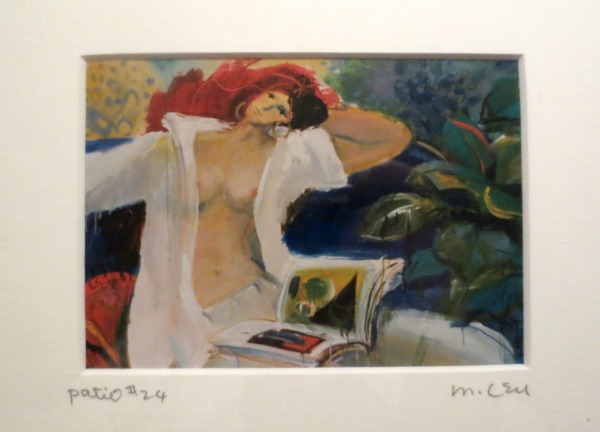 Also in this crappy store I found three little framed signed prints by M. Leu. I should have bought all three (darn, darn, darn), but instead I bought just the one I liked the best. (This is how I wish I looked when I’m sitting out on our front stoop…well, perhaps a bit more clothed!) 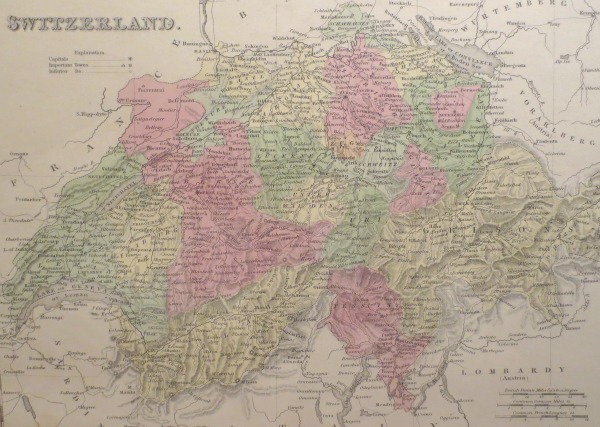 Later I did some research and “M. Leu” is artist Michael Leu. Love the colors in his work. I’ll close for now as I’ve got to get back to listing more things. Very happy for your great sales, Karen. What you are doing provides happiness to people and that’s a good thing. Remember, it is always too soon to give up! ah, the life of the vintage seller- constant ups & downs- just enjoy the ups (as you did in this post) and distract yourself with wine during the downs. works for me!